I first ‘met’ Vera Stanhope in the TV dramatisations of Ann Cleeves’ novels, which I enjoyed. 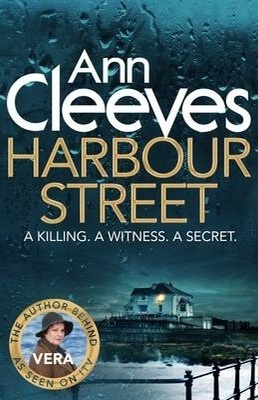 But once I began reading Ann Cleeves’ books I discovered that they are even better than the TV versions! The latest one I’ve read is Harbour Street, the sixth book in the Vera series – it’s fantastic. If you’ve watched On Harbour Street, the TV adaptation broadcast last year, you’ll find that it didn’t strictly follow the book much at all – and you won’t know who the murderer is – it’s a different person in the book! It’s going to be a contender for my best book of the year, because I loved it. It has everything I like in a crime fiction novel – setting, characters and a cleverly constructed plot. I didn’t guess who the murderer was but realised afterwards that all the clues had been there, skilfully woven into the narrative, hidden among the dead-ends and red herrings, so that I’d read on without realising their significance. It’s ten days before Christmas, the Newcastle Metro is packed with shoppers, babies screaming, office workers merry after pre-Christmas parties, teenagers kissing. But when the train has to stop because of the snow they all pile off the train – except for one old lady, Margaret Krukowski, who was fatally stabbed. No one saw the murder take place even though, or maybe because the train was packed with people, including Detective Joe Ashworth travelling home with his daughter, Jessie, from carol singing in Newcastle Cathedral. Margaret had lived in a guest house on Harbour Street in Mardle, a coastal town in South Northumberland and it is here that Vera concentrates their investigation with the occupants of the guest house, the Coble, the pub opposite and the Haven, a hostel for homeless women, where Margaret had been a volunteer. It soon becomes obvious that Margaret was a woman with many secrets in her past – stemming from 1970 when her Polish husband Pawel Krukowski had left her. Then a second murder occurs and an earlier crime comes to light – but who is the killer? Ann Cleeves is a superb storyteller. Her descriptions get right inside my brain; she has the skill to make the scenes materialise, in front of my eyes, and not because I’ve seen the TV adaptation which was filmed at a different time of year and in a different place from the location of Mardle in the book. Her characters are fully formed with emotions and feelings, backgrounds and complicated relationships, just as in real life, with all the sights, sounds, sensations and smells. Her dialogue is authentic, never awkward and you are never left wondering who is talking. Her books are deceptively easy to read, moving swiftly along as the tension rises. They are layered, cleverly plotted and above all convincing. As in her other books I had several suspects in mind but hadn’t realised just how much wool had been pulled over my eyes until Margaret’s killer was revealed. The Crow Trap by Ann Cleeves is the first book in her Vera Stanhope series. I’ve been thinking (and writing) about my difficulties in reading books where I think the detail and description swamp the characters and plot, but I had absolutely no problems with that in The Crow Trap – I think Ann Cleeves has got the balance just right. It begins with chapters about three of the female characters, Rachael, Anne and Grace all staying at Baikie’s an isolated cottage on the North Pennines whilst they carry out an environmental survey. When Rachael arrives at the cottage she is confronted by the body of her friend Bella Furness, who it appears has committed suicide. I was so drawn in by the character portraits and the vivid descriptions of the setting, that I almost forgot that this is a murder mystery. Then Grace is found dead and the mystery really begins. The identity of the killer foxed me. I kept changing my mind about who I thought it was and when it was revealed I was surprised, because although I’d worked out the motive, I’d got the circumstances completely wrong! The My Kind of Mystery theme began on 1 February and this book really is ‘my kind of mystery’. A most satisfying book. The Glass Room is the fifth book in Ann Cleeves’s Vera Stanhope series. Set in the Northumberland countryside in an isolated country house, a number of aspiring authors are gathered at the Writers’ House, run by Miranda Barton, to work on their novels. It’s an old fortified farmhouse close to the sea, sheltered on the landward side by trees. DI Vera Stanhope’s neighbour, Joanna has gone missing and her husband, Jack is frantic to find her, so Vera, having tracked her down to the Writers’ House goes to see her, only to find that one of the visiting tutors, Professor Tony Ferdinand has been murdered in the conservatory, stabbed with a kitchen knife. And Joanna is the chief suspect. The interplay between the Vera and Sergeant Joe Ashworth is excellent. Joe isn’t as easily managed as Vera would want him to be and yet she likes that in him. And her relationship with the rest of her team leaves much to be desired, but she is human – and she gets results. All in all, this is a book I thoroughly enjoyed and one that kept me guessing to the end. Ann Cleeves has become one of my favourite writers this year and Silent Voices is one of the best crime fiction books I’ve read recently. Although it’s the fourth in her Vera Stanhope series it’s the first that I’ve read. I did watch some of the TV versions of Vera earlier this year but I missed this one, so the plot was completely new to me. Doing what she does best, Vera pulls her team together and sets them interviewing staff and those connected to the victim, while she and colleague Sergeant Joe Ashworth work to find a motive. While Joe struggles to reconcile his home life with the demands of the job, Vera revels being back in charge of an investigation. Death has never made her feel so alive. And when they discover that the victim had worked in social services – and was involved in a shocking case involving a young child – it seems the two are somehow connected. But things are rarely as they seem . . . The other characters are equally as well- defined. As well as creating memorable and individual characters Ann Cleeves conveys a strong sense of place bringing the Northumbrian countryside, towns and villages to life as I read. The plot is nicely complicated and although I had an inkling about the killer I was wrong, but looking back I could see where I’d been misled. Silent Voices is an excellent book, one that kept me turning the pages and exercising my brain.